The chance to design district-scale sustainability from scratch is a rare thing; more often, smaller opportunities arise piecemeal. In the higher-education sector, however, even a single building can have far-reaching impact. In constructing a new welcome center with administrative offices, a social hub, and classrooms at its campus entrance, Hampshire College, a liberal arts school in Amherst, Massachusetts, perceived a fit between its institutional values and an ambitious environmental effort. The college’s recently completed R.W. Kern Center, designed by Cambridge, Massachusetts–based Bruner/Cott, is built to meet the Living Building Challenge (LBC) and has just embarked on the operational tracking year required for certification. Widely considered the built environment’s most rigorous performance standard, LBC consists of seven performance categories, called petals: place, water, energy, health and happiness, materials, equity, and beauty. These are subdivided into a total of 20 imperatives, or obligatory criteria, each of which focuses on a particular aspect of creating a project in harmony with nature. 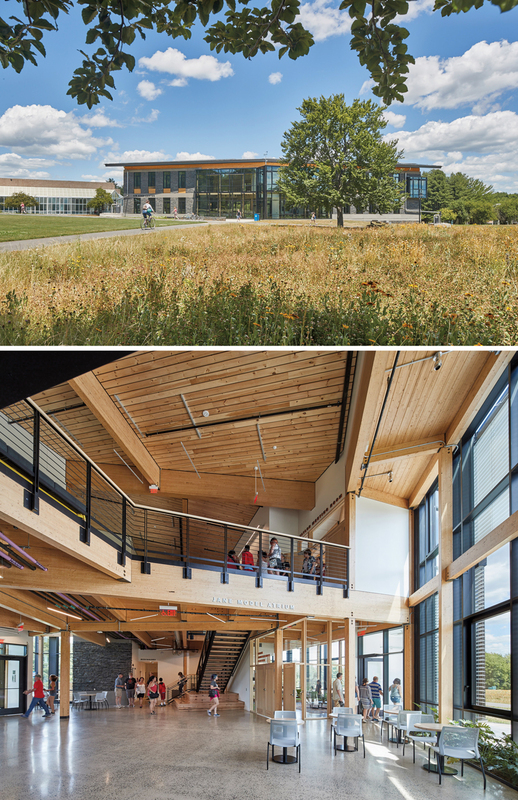 RESTRAINED PALETTE To satisfy the tough product-sourcing requirements for the Living Building Challenge, Bruner/Cott limited the primary materials to local stone, wood, and concrete on the Kern Center at Hampshire College. Instead, Kern integrates its building systems into architecture that makes human scale and experience the priority and emphasizes biophilic principles. To ground the building visually, concrete bands in the stone cladding grow thicker as they descend, creating the impression of a firmly rooted mass. A double-height glazed volume provides a central focal point to orient users. A narrow footprint, with glazing on opposite sides and framed views of the surroundings, creates a sense of the outdoors flowing through the interior. The solar-optimized form and materials from the bioregion provide a tangible connection to place. The use of local materials, including regional stone and wood, and doors and cabinets salvaged from a nearby hospital, also proved an important strategy in meeting the LBC’s materials imperatives. These criteria, which many project teams consider the standard’s most challenging aspect, include a Red List of hazardous substances to avoid, requirements for responsible sourcing, and a set distance from the building site within which products must be obtained. 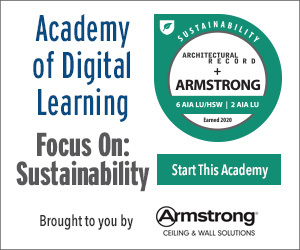 Although the architects initially worried about assembling a materials palette that met all of the criteria, they learned “that it’s very possible to source the materials for this high level of sustainability in a local economy,” says Forney. As a result of the project’s achievements, students report going out of their way to spend time in the building. They say it makes them feel calm, quiet, and connected. Apparently the construction workers felt it too: Kern was the only project the superintendent had seen in 30 years where the trades preferred to eat lunch inside. Even before the building opened, students began using it in their curricula and project work. Partway into the 12-month performance-documentation period required for Living Building certification, Kern’s lessons are already reaching the larger world: with hands-on experience of the building’s rainwater-management system, a group of Hampshire undergrads entered a filtration project in the American Ecological Engineering Society’s design challenge and carried off first prize. 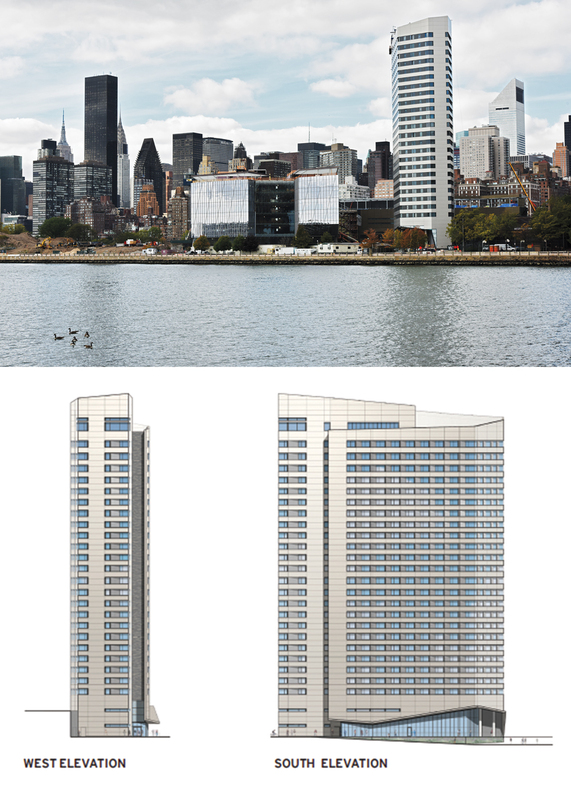 NEW HEIGHTS At 26 stories, Handel’s residential tower (top, on the right in picture) on the new Cornell Tech campus in New York is expected to be the world’s tallest and largest Passive House building once it is complete next summer. The campus also includes a research and development hub by Weiss/Manfredi (top, at center) and an academic building by Morphosis. Developed in Germany, the goal of Passive House is to drastically reduce energy consumption while improving occupant comfort. Based on absolute energy use rather than enhancement over code, Passive House permits a maximum heating energy of 4.75 kBtu/ft2/yr, a maximum cooling energy of 5.39 kBtu/ft2/yr, and a total building energy use intensity (EUI) of 38 kBtu/ft2/yr. Compared with the median EUI for New York buildings its size, the House is expected to reduce energy consumption by almost 75 percent. The building relies on familiar passive design strategies, amplified to new levels. Its siting is optimized to maximize solar gains in the winter but minimize them during the summer. Its plan is a convex polygon that keeps the surface-to-volume ratio low, except at one corner. Here the polygon opens to create a reveal that houses louvers and extends up the full height of the building. It encloses an exterior space on each floor to accommodate condensing units for an energy-efficient variable refrigerant flow (VRF) system for heating and cooling. The louvered slot also allows the building to breathe: from there, filtered and tempered fresh air is supplied to each bedroom and living room (a radical innovation for a residential high-rise). The reveal also works architecturally, expressing the building enclosure as a wrapping. To maintain a continuous blanket of insulation, eliminate thermal bridging, and reduce the number of joints needing to be sealed on-site against air infiltration, the project team designed custom curtain wall panels. Built off-site for improved quality control, the 9-foot-tall by 36-foot-long panels were delivered with triple-glazed windows pre-installed. The assembly is designed to achieve an overall R-value of 17 and a maximum air infiltration rate of 0.6 air changes per hour at 50 pascals of pressure. In order to achieve Passive House certification this infiltration rate must be confirmed with a blower door test once construction is complete. The level of airtightness was a particular worry for team members due to the project’s unprecedented scale and the many conditions that could be prone to leaks, including the panel joints, fenestration, and building systems’ penetrations through the facade. So, in order to identify faulty joints before they were enclosed behind drywall and beyond reach, they devised a way to conduct preliminary blower door tests as well as a regimen for spot checks, explains Deborah Moelis, a senior associate at Handel. SKIN TIGHT To reduce the number of joints that would need to be air-sealed on-site, the exterior facade for the House at Cornell Tech was built in a factory as 9-foot-tall, 36-foot-long panels. These were shipped to the site with their triple-glazed windows already installed. Apart from the intensity of quality control, the biggest challenge in scaling Passive House up to a high-rise was the ventilation and exhaust system: adequate separation on individual units was impossible. Ventilation was solved through design, with the louvered reveal. But exhaust was solved through policy, pushing out another element on the green building frontier with a revision to New York City’s building code. Regulations now permit joining bathroom and kitchen exhausts as they discharge through the roof to facilitate the energy-saving strategy of heat recovery. This change in policy “was an exciting moment for the project,” says Moelis. It’s societal and regulatory changes like this, along with the innumerable people who will occupy and visit the Cornell project and other ultrasustainable campus buildings across the country, that make sustainability in the higher-education sector more than just an academic exercise. These materials should be reviewed prior to taking the course quiz. Katherine Logan is an architectural designer and a writer focusing on design, sustainability, and well-being.